This recipe I found on Pinterest and it is awesome!!! Even though Dreamfields pasta does not make jumbo shells, the San Giorgrio shells are only 40 net carbs if you have 7 shells. Believe me, these gems are extremely filling so no fear of going over on your carbs with this meal. 1. In a large pot over high heat, boil water and prepare pasta shells as directed on package. Cook pasta shells only until al dente (approx. 5 minutes). The pasta will finish cooking when the dish is baked. Drain the pasta shells and set aside. 2. In a large bowl, combine the rest of the ingredients, except the 1/4 cup of cheese for the topping. Fill the pasta shells with the filling and place in a baking dish. Sprinkle the remaining 1/4 cup of cheese over filled shells. 3. 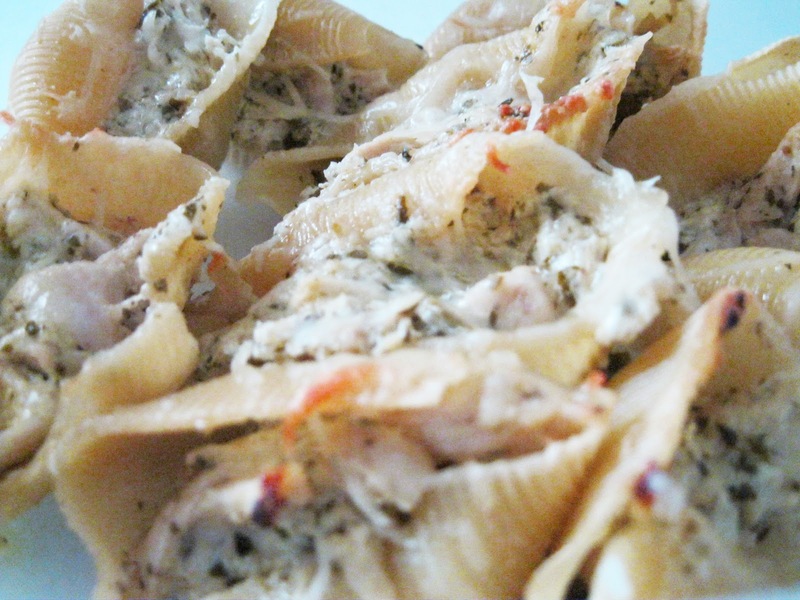 Preheat oven 350ºF and bake shells uncovered for 30 minutes or until shells are bubbling hot and cheese melts. I used chicken that was cut for chicken tenders, but 1 large chicken breast would also work. Boiled the chicken for 15 minutes making sure there was no pink, drained and rinsed in cool water making it easier to then handle and shred. When I showed my friend this recipe, her first comment was to make sure and add some water to the bottom of the dish otherwise the shells would end up dry and tough. She was right. Since you only cook the pasta until al dente, the shells were definitely firm to slightly hard. Since there isn't much liquid in the rest of the ingredients, I'm not sure how the shells would have softened. So my modification to this recipe is to add about 2-3 tablespoons of water in the dish after you've finished putting in the stuffed shells. I went ahead and doubled the recipe, putting one casserole dish in the freezer. This was just one of those recipes that I knew would be good. Already had all the ingredients, so why not take a few extra minutes and put together one for a future dinner?